© 2004 by Sharon Rich. All rights reserved. Left: A sample page of Jeanette’s autobiography manuscript with her writing on it. 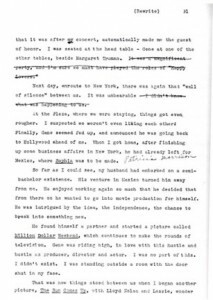 The original typewritten manuscript was a collaboration of Jeanette and author Fredda Dudley Balling and each page has been reproduced with all of Jeanette’s notations, deletions and additions on it. On this page Jeanette discusses problems in her marriage to Gene Raymond, who “had embarked on a semi-bachelor existence”. This book tells the fascinating story of Jeanette MacDonald’s ten-year effort to write an autobiography. The ill-fated project was never published and there was much speculation about which version—if any, survived. This incomplete, unpolished version represents a working manuscript from the summer of 1960. It was written by Fredda Dudley Balling, a well-known movie magazine writer hired by MacDonald to salvage her problem-plagued book. The facsimile edition runs over 350 typewritten pages. It does not purport to be a complete book. But the manuscript is being published for historical relevance, since Jeanette herself has written all over the pages, providing corrections, comments, pointing out passages that are untrue, crossing out sections or pages that are emotionally painful. In short, this early version provides greater insight and relative truth than the later, more censored, “complete” version. Balling ultimately edited almost 50 pages out of this edition, with the knowledge that the publisher wanted a final length of 300 pages. But despite Fredda Balling’s skills as a writer, Jeanette’s book was still deemed unpublishable for a variety of reasons. After much back and forth, Jeanette herself ultimately pulled the plug on the project. Fredda was upset but understanding, noting that Jeanette was “desperately” ill. The two women stayed in touch through Jeanette’s final illness. After Jeanette’s death (at 61) in 1965, Balling made attempts to publish the manuscript, either in first person or as a biography. But Balling was now thwarted by MacDonald’s widower, Gene Raymond, who tried to stop any book being written about his wife. Balling was successful, however, in publishing a definitive and lengthy magazine tribute to MacDonald in Motion Picture magazine, which was very well received. It painted a generally correct picture of Jeanette—to a point. Whether Fredda wanted to say more or not, she would have felt unable to while Gene Raymond still lived. Fredda continued writing after the Jeanette fiasco, co-authoring director Tay Garnett’s autobiography, Light Your Torches and Pull Up Your Tights (1973). She died in 1990 just shy of her 85th birthday. The original was divided into three separate notebooks. Each section was typed on onionskin paper and bound with a 3-hole punch. Where Jeanette made penciled comments (often on blank sides), they have been reproduced as well (unless completely faded or illegible). I have provided an introduction to each section and where necessary, have annotated within the section itself. …“In June 1960, Jeanette telephoned me and told me the story of the autobiography she had been trying to write for about three years. At that point, four different writers had worked with her, but she still didn’t have a script satisfactory to her publishers. She was facing a September 30th deadline and was truly frantic. “I had written several stories about her at that point, and I was deeply fond of her, so the two of us set to work under forced draft to complete a satisfactory script ahead of deadline. “It was slow and difficult going. The #4 writer had been British, so the script was larded with such non-MacDonald phrases as “I took a manicure,” and “Rather strange, what?” She and I howled about them, although she had been furious about their use at first. “In addition to having to reorganize, rephrase, and re-assemble the whole book, we had to work against Jeanette’s fragile health. Ordinarily we met at eleven, worked until 1:30. Took 30 minutes for luncheon, and worked until 3 P.M. However, even our 30 minute luncheon break was productive, because I asked her to clarify this situation, expand that. I took notes. “When September 30 dawned, we had 200 pages completed, out of a projected 300 pages…However, the publisher was pleased by those 200 pages, and extended the deadline to October 30.